This summer I went swimming at the beach. Played in the waves about half and hour. At one point I realized my Samsung Galaxy S4, less than a year old, was in my pocket. Nooooooooooo! I didn't think I had it with me, but I'm so used to carrying it that it has become invisible. 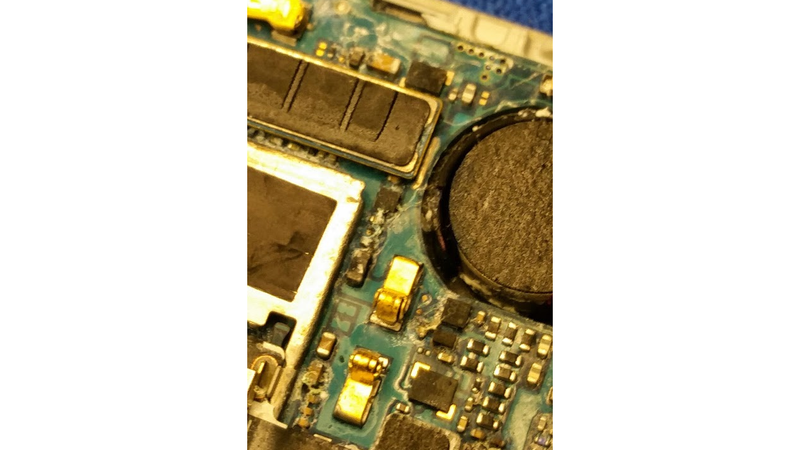 It was inside a huge rubbery Otterbox Defender case. Thank goodness I didn't lose it, I would have gone nuts combing the beach for it. On the outside the phone looked fine. I immediately popped off the back and took out the battery. I had no tools with me on vacation so I couldn't do much more. I dried it out with a paper towel and put it in a bag of rice and left it. It had a few drops of water inside around the battery but didn't look too bad. Between the case and the phone, it seems pretty tight. Maybe it will be OK? Some people suggested I should rinse it with fresh water to get the salt water out, but that seemed like I'd be destroying it more, when it didn't seem terribly wet inside. I left it in for 24 hours and tried to power it up. Nothing. Totally dead. I left it to charge a while. Still dead. I took the battery out and tried to power it up, thinking maybe the battery was shorted. Nothing. Dead. A voltmeter on the terminals circled in the picture yields 1.8V when the phone is plugged in, and goes away when it is unplugged. This is the input for the wireless charging. This gives me some hope that the phone is not a brick. But it still doesn't power up. I'm out of state with no phone and no tools. I need a phone to live, so I sucked it up and went to the local Best Buy and used an upgrade to replace it with a slight newer Samsung Galaxy S5. Ended up costing $100 and two more years. But at least the pain of stupidity faded a bit with a shiny new phone. Now I was free to try some more extreme measures to fix the phone. When I get home two days later, and have my tools I open it up. The phone has been in rice the whole time. Standard youtube video shows you how to open it. 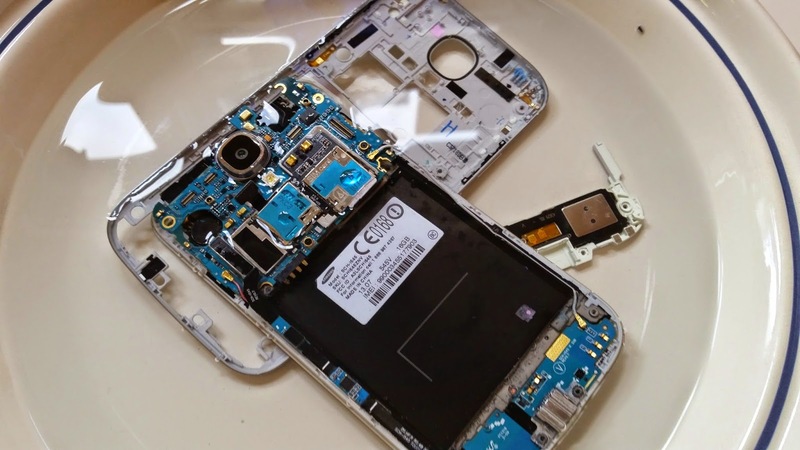 It is surprisingly easy for a phone to get apart. Once the screws are out, I used my fingernail. Things look OK at first glance, but close inspection and YUCK! Maybe you can't see from the pictures but it looks like a friggin salt mine. Salt is conductive and if it is not corroded, it is probably shorted in all kinds of places. There is salt everywhere, caked on the components. I popped out the motherboard by lifting the connectors and rinsed it in alcohol. I poured alcohol all over the exposed boards. Wiped what I could and let it evaporate. Once it dries it looks better, but there is still salt caked everywhere. Can't figure out how to make it better. I re-assmbled and plugged it in. Still nothing. Totally dead. This phone may be a lost cause. I'll add more if I think of a way to clean it better. Maybe a fresh water bath will dissolve it better than water. At this point a week has passed since it got submerged in salt water. In hindsight I should have done this immediately. The damage may have already been done. I just didn't have the nerve. I can't believe I did this, it felt so wrong! 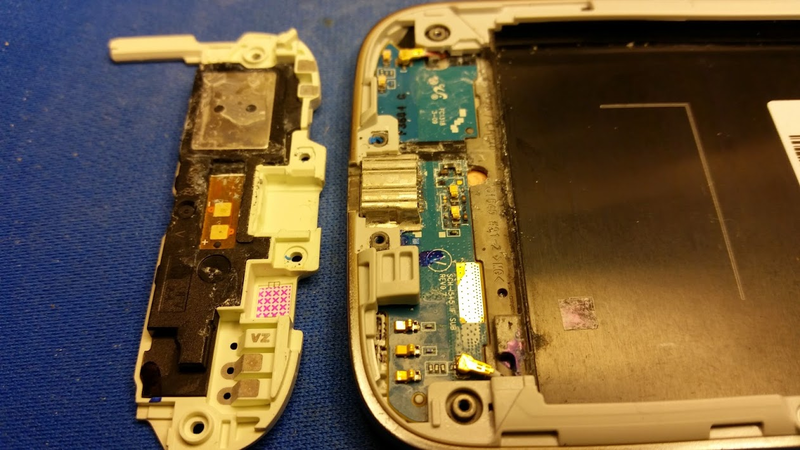 I disassembled the phone and gave it a bath in fresh water. I took off the cover and removed the connectors to the motherboard so that water could get underneath. I did not totally take it apart. I rinsed the boards each a couple times and changed the water a couple times to get the salt off. Never have I treated electronics this way! Back in the rice while still disassembled. I will let it sit for a day and dry out. After it dried out I looked at it, and it is still full of salt. This photo is bad but you can see salt caked around between the components. 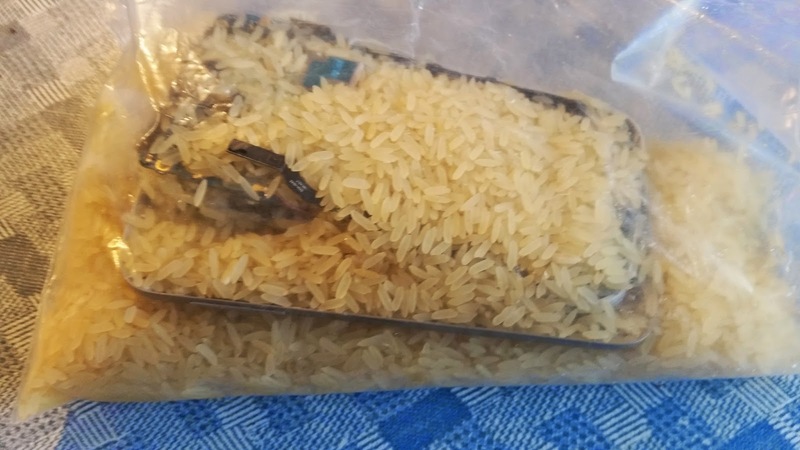 I put the phone under running warm water for 10 minutes, and back into the rice. Not looking good. After the phone dryed, the boards don't look much better. There is still salt caked in between the components. Dang. This needs some aggressive cleaning. Strangely there is some minor improvement. 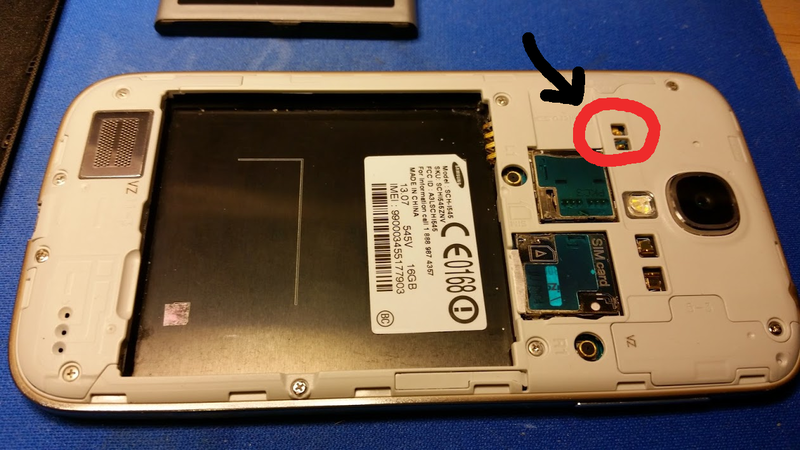 The terminals on the back of the phone circled above, now read 5V instead of 1.8V!! So I have removed some of the shorting material. However the phone is still totally DOA and won't turn on and no LEDs light. I'll try charging for a bit but I should see a charging screen even with a dead battery. Stay tuned.. but if this happens to you, don't expect to ever use your phone again :). Quick post on a successful laptop fix. I was in a hurry and didn't take pictures, so this post may be less helpful than average. However this was an easy fix that anyone with a small screwdriver can do. 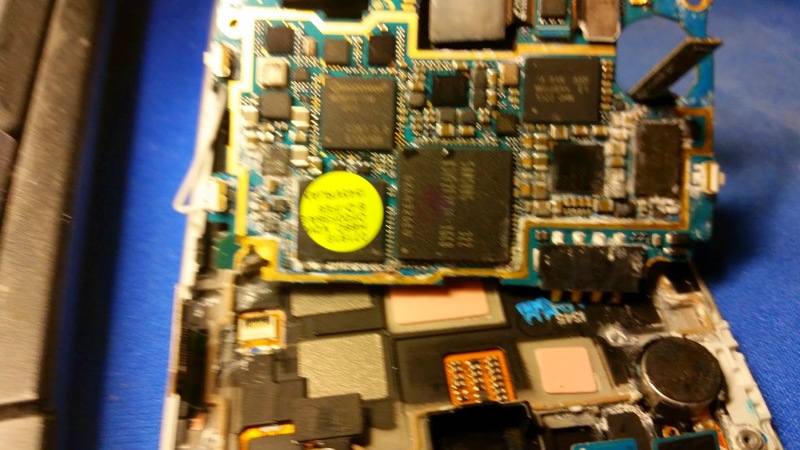 This laptop had an intermittent screen. As the user manipulated the laptop the video would flicker, tear, invert, lose colors, etc. Problem happened enough that it was really irritating. Wiggling and re positioning made it work again briefly. This was not just the backlight turning on and off, the video was being corrupted. Backlight stayed on the whole time. There were no obvious cracks or sections of the screen acting differently, so it didn't look like LCD trauma. I thought the LCD panel was probably cracked internally or the video cable was broken at the hinge, as the video cables usually go through the hinges and this machine had a rough life. My first thought was I'd being buying a replacement LCD but I was wrong. To rule out the possibility that the video chip is coming loose/desoldered from the motherboard, I plugged in an external monitor. Video was fine. So the motherboard and graphics are working. First I pried around the screen bezel and it pops right off. No screws at all. Four screws hold down the panel. Flip it over and the video connector is on the back. Removed and reseated it. Wiggled and flexed the panel, cable and connector. There really seemed to be no correlation to wiggling something around the screen, hinges, connector and the screen flickering. More manipulation and I decided that the loose wire must be the other end of the video cable. Snapped the screen and bezel back together. Flipped it over and began removing screws. 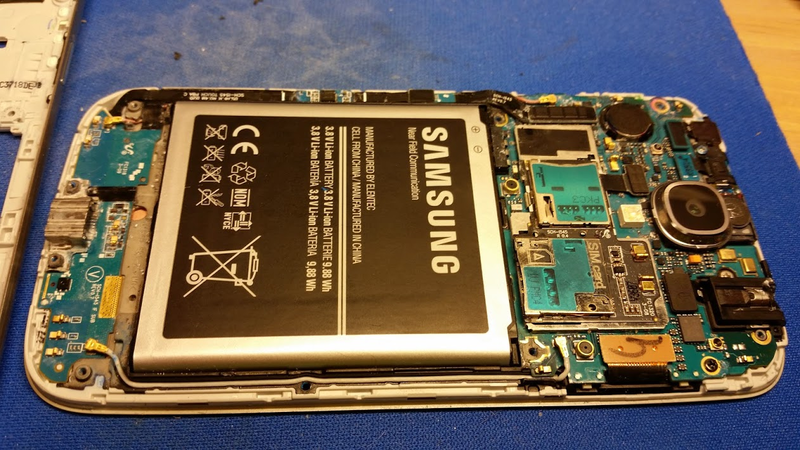 Removed the battery. Several screws on the back surface, remove the hard drive cover and there are about 10 more sprinkled around. You must remove them ALL. None are hidden, thank goodness. 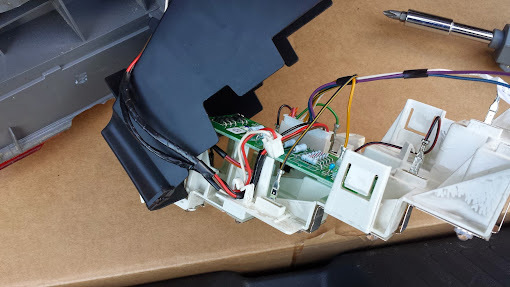 (actually one is next to the wifi module and was partially under a sticker) They are little black Philips head. Once they are all out you can pry around the perimeter and the keyboard and top cover pops off without much resistance. If you miss one screw, the keyboard and top cover won't come off. Pry it a bit and you will quickly find the one you missed. Left the keyboard cable connected and folded top cover out of the way. Underneath is another video connector like the one on the back of the LCD. Follow the black wire bundle from the screen to find it. Unseated and reseated and the problem went away! W00t! A bit of finagling and popping to put the cover back on and putting in all the screws. Good as new. 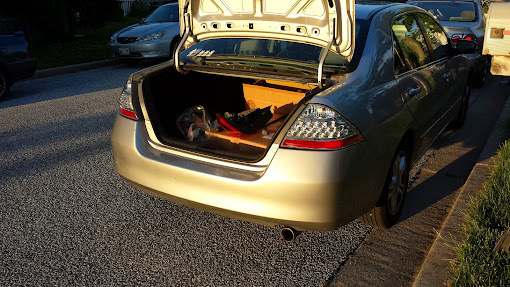 Installed custom taillights on the 2007 Honda Accord. Backed into another car that backed up the same time as me. 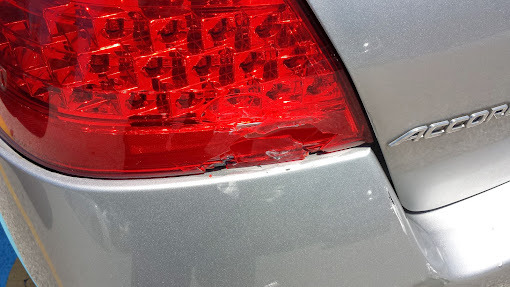 Ended up with a scuffed bumper and a busted taillight. Boo! Wiped off the bumper, i'm gonna live with the scratches. Need to fix the taillight. My car is a 4 cylinder 4DR EX sedan. 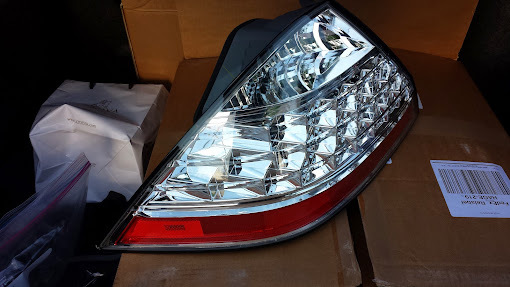 Looked around on the web and found some custom tail lights for not a lot more than an OEM replacement. Perfect excuse for some low key bling. I like the look of clear taillights on a silver car. Smoke ones won't look good on a light colored car. I never liked the monocrome plain tail lights this car came with anyway. Bought these. They don't come with the LEDs, luckily the old ones were still working, only the cover got broken. I was concerned these were cheaper by $50 than others I found on the web. They came and they look very nice, the picture doesn't do justice. Here is what they look like. Sweet. Also bought some yellow LED turn signal bulbs. When I go clear I don't want the turn signals to be white. Plus I like yellow turn signals better. Paid $9.99 for two. I did decide after the fact that I need load resistors to slow down the flashing with the LED bulbs. Should have bought bulbs that came with them. Watched this youtube video, which gave me the confidence to take off the bumper cover. I won't attempt to go through the procedure, because the video does that just fine. This post is just to document that what I did worked, and was no trouble at all. Anybody could do this. The whole thing took about 2 hours and required screwdrivers and a socket wrench. Some of the screws and bolts are a little tricky to get your tools on, but not too bad as auto repairs go. 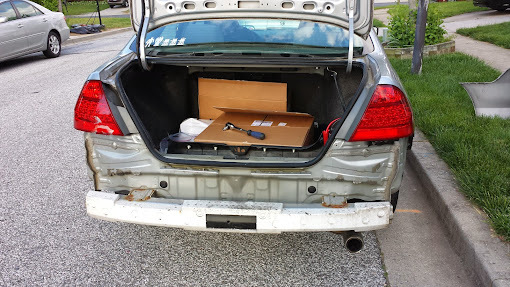 The key lesson I learned when the lights came, is that you have to take the bumper cover off to remove the tail lights. It is probably possible to get them off without doing so, if you reach up into the bumper really far and loosen the bolts. However taking the bumper cover off is ridiculously easy. Two bolts, six screws (3 per wheel well) and two pins under the bumper and it just pops off. Putting it back on is easy, just line it up and pop it back into place. I transferred the LED light bars from the old lights to the new and didn't need to buy new ones, that saved a lot of money. The yellow LED turn signal bulbs took some tinkering. Had to bend the wires out a bit and wiggle them a lot to get them to fit in the socket. It took two or three tries to get them to light up. 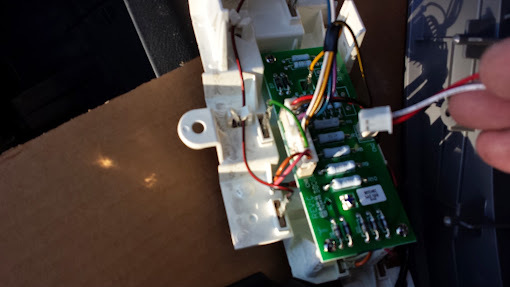 The wires have to be just right, and I think the bulbs only work in one way, and they can be inserted in either polarity. Keep tinkering and trying and they will work. 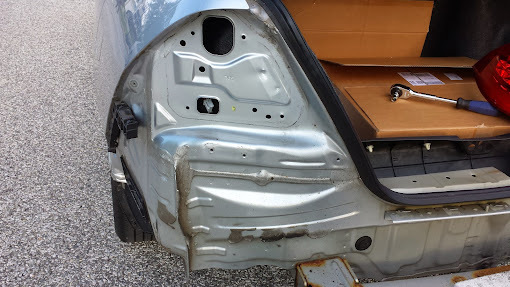 The bumper cover is off. Easy as pie. Don't let the wife see the car like this! She'd freak. Tail light come off. Two bolts under the bumper and 4 nuts inside to remove. Transferred the LED array. Four screws and it comes right out. Had to pop it open and unplug the one marker light lead and plug in the one built into the new taillight assembly. Plugging in the new wire inside the LED cover. Back together with the bumper cover back on. Took me just under two hours to do the whole job. Together and looking good just as the sun was going down. I expanded the little windows/linux PC Java widget I made to decode bits while programming JTAG registers. It was proving very useful. Now it also includes Gray code. This is a live tool that as soon as you enter a number in one format, it instantly updates the value in the others. This saves a ton of time when you read a register and the individual bits are used set switches or report values and it is all glommed together into a big word. A minimal amount of button clicking and typing decodes a hex value into it's bits, allows you to click one on or off, and tells you the new hex value. I also added a big display of the hex and binary at the top. Now this wastes a bit of screen space so it might get canned. The tool is getting a bit big. I've tested it pretty thoroughly and it seems to be totally solid.